Offer your customers the classic flavor and aroma of hot cocoa with the convenience of this gourmet hot cocoa mix! When mixed with hot water, this drink mix produces a smooth and creamy consistency and deliciously irresistible chocolate taste. Top off the finished beverage with whipped cream or marshmallows for an extra special treat. The perfect addition to any establishment, this hot cocoa mix is sure to please patrons at your coffee shop, restaurant, concession stand, convenience store, waiting room, or lobby. This hot cocoa mix allows the favorite cold-weather drink to be enjoyed in any season! Call me crazy, but I like this brand a lot. I know it is the cheapest one out there. The hot chocolate is really good. The product matches the price. In my vending cappuccino machines, I would have to increase the quantity of powder to match the flavor of other brands. If you are a person who looks for an "apples to apples" purchase, the hershey's mix is better. Love these hot chocolate and cappuccino mixes. The cost is right on comparison with other websites, and the Product is great tasting. No blocking up in the cappuccino machine. Its a very good tasting cocoa mix. It's much better than the brand I used to buy from my local distributor. Much cheaper too.. so I am very happy. We used this when we had a hot chocolate machine. It worked really well and had a great flavor. A really good price for a quality product. We use this as the base for our hot chocolate, and add some details to make it our own, but it is incredibly rich and delicious. Some hot chocolates taste powdery, but this one is perfect! I LOVE THIS HOT CHOCOLATE! A little goes along way! It is rich in flavor and I use it both in hot chocolate and for my cookies! Tastes great! Great BUY! This is such a great addition to our cafe in the winter months. This has been the best brand by far. We usually sell out! First time buying, good product, need a couple scoops if you're using on a hot cocoa bar. But it did the trick! It goes a long way! Excellent all around basic hot chocolate mix that works well for a sweeter, more universal flavor than darker chocolate varieties. Shipped very quickly and a good value. Absolute favorite with customers. Its easy to pour and quick. It's just the right size to fit in my coffee tray along with common essentials. It doesn't taste very good. You have to use a lot more than they suggest for a serving size. I had to buy another brand to mix with it to make it taste decent. We love the gourmet hot chocolate/cocoa mix. We always bought our dunk-a-chinos at a local company but we never knew how full the cups would be. Then we tried your hot chocolate. We have perfected the flavor we like much better than the bought type. We make them every day at work with your cocoa and. creamer. Think of the money we have saved with the best tasting cocoa. I really don't care much for this cocoa. It doesn't have much flavor at all and there's excess thickener in the mix in a futile attempt to mimic a richer type cocoa but, instead makes a goopy-like drink. I had to add cocoa and milk to it in order to make it drinkable. It may suffice for some people but, I won't be buying it again. I used this cocoa mix in a few different ways and enjoyed it most when it was mixed with a single shot of espresso or added to my morning coffee. As a stand-alone drink, it's acceptable but not my favorite. The water needs to be quite hot to dissolve the powder. The amount of sugar seemed appropriate, but I had to use a lot of mix to get the more chocolatey flavor to come through. A nice value hot chocolate mix that is great for winter fundraisers. The chocolate flavor is a little weak, so we double up on the powder. We ordered this hot chocolate to serve to our guests over Christmas and it was wonderful! It was so simple to make, and has a rich and creamy texture that tasted like gourmet hot chocolate. We would absolutely order this hot chocolate again and highly recommend it. The 2 lb. Gourmet Hot Chocolate / Cocoa Mix is rich a delicious, for those who like a weaker one just mix with water, if you like a very rich and creamy style go with milk, or if you're like me, go half milk and half water, it's delicious with a rich chocolate taste and doesn't taste artificial like some do. This hot chocolate mix is good for a regular cup of hot chocolate, it is similar to swiss miss in the flavor. The powder must be mixed really well prior to serving otherwise there will be lack of flavor and chocolate chunks at the bottom of the cup. 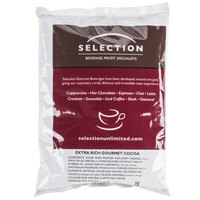 This bulk 2 lb bag of hot chocolate is perfect for hot chocolate dispenser machines, or for making hot chocolate manually. The instructions say to use 3 tablespoons per 6 oz of hot water, but I have found that 2 tablespoons is plenty to make a nice rich cup of hot chocolate. Either way, this hot chocolate is a great value and tastes great. A nice value hot chocolate that has a pretty good taste, but not as good as higher end brands. A great mix to use with a dispenser machine, but lacks the full, rich chocolate flavor I love. This chocolate mix is great because it mixes smooth and evenly. No lumps! Tastes great and is paired with mini marshmallows and chocolate sauce as garnish. A really great value product that has an unbeatable price point. It is great for dispenser type machines. I was little disappointed in the bland taste of the mix, and really wish is had more chocolate flavor. Creamy, delicious, mixes well. Not too sweet nor too bitter. We add other flavor shots to it like caramel, mint and coconut and it pairs well with anything. We bought this mix to make drinks for kids, but we also can’t keep away from it! When added to our milk of choice we feel better knowing that it is a healthier option than the (watered down )pre-mixed chocolate milk drinks at the grocery. With its smooth texture, our drinks now, feel rich on the tongue, not grainy or lacking in our opinion. I’ve used it as a coffee “sweetener “ too, not that it is sweet, but that the flavour is delicious! Hot or cold, this is a crowd FAVORITE! This mix is the best price, quality and delivery was unexpectedly quick too. We used this hot cocoa mix for a church fund raiser on a very damp, chilly day in May. When its 46 degrees and raining, hot cocoa out sells soft drinks like crazy! All our customers loved the rich, creamy flavour and our volunteers appreciated the ease of mixing. We'll be ordering double for next year's fund raiser! This is a great product! We use this for our hot cocoas, mochas and frozen hot chocolates. It dissovles well in milk and also mixes well when frozen. The hot chocolate is pretty good. Most customers really like it and if you out it in with auctually chocolate syrup it tastes great. Good product. This cocoa Mix test really good, we use in our self service cappuccino machine, also on a hot milk, it has sugar so we just mix and it is ready to drink. I love this hot chocolate flavor. It tastes really good and my customers love it too. So I highly recommend it. You won't regret it. Pretty decent hot chocolate. Doesn't beat homemade varieties but for the size, and price it's a good value for large events and you can make a better profit. The Hot chocolate was a big hit with everyone so much so that we ran out of it right a way. Very Very good Flavor. Decent mix of hot chocolate. I Krefeld making my own but this is a good alternative. It mixes well and is easily stored for future use. Overall, most of our customers really enjoy the hot chocolate for what it is in a snack bar setting. If I could recommend anything it would be to make it a bit creamier. Would still recommend as a great value. This is a wonderful rich creamy hot chocolate as good as any premium brand we have tried. It is a wonderful addition to our hot beverage machine as an alternative to cappuccino so the kids can get a good hot drink too in cool weather or with breakfasts. Will continue to use this cocoa as long as it's available. These were very inexpensive but taste great! We actually use them in a specialty drink we mix with other chocolate powders but these have improved the drink tremendously. We order these by the case, ships fast, sells fast. This was a great hot chocolate for our hot chocolate machine. The size of the bag was just right to fill the container inside the machine. I used this at home without a machine. I manually measure the amount of powder that is stated you should use and mix it with hot water. I found this hot chocolate to be too watery. Maybe if I used more mix it would taste creamier. I prefer Swiss Miss to this brand. Best hot chocolate EVER, everybody loves it! It is great with milk or hot water, and, always, a little whipped cream on top, yummy yummy! Great product! We use in our college location and makes a great product. We use the product and just add water. 1/3 cup mix with 16 oz hot water is perfect if your don't have a cappuccino machine in your location! The hot chocolate has an excellent taste. We use 1/4 cup in a 12oz coffee cup and it's great! Add whip cream for a perfect cup. The quality is amazing for the price. By far the best price I have found her! I will be ordering this product from now on. This is a great quality of cocoa mix. It is perfect for hot chocolate, cappuccine and mocoa coffee! We have ordered this from Websterauntstore.com because its affordable and great quality! Swiss Miss may be better. The word gourmet made to feel that the taste would be better for some reason. It does have a mild chocolate profile and becomes very foamy. I like to add some of the syrups, like the cheesecake syrup, to add to the flavor of the cocoa. The cold mornings just are not the same after a cup of hot chocolate. You cannot beat this value. The price is excellent for the quality of this mix. This is excellent for promotional events where you may be giving away inexpensive/cheap hot chocolate. It's good enough to sell, but if you're looking for promotional ideas, hot chocolate is a winner. We have been selling this hot cocoa out of our concession trailer for about a month now and it is selling great. The customers seem to enjoy the chocolate flavor and the warmth of it. I highly recommend this. Switched to this product about 6 months ago and absolutely love the product. Comparable to a higher priced mix. This product has worked great in 2 different dispensing machines that we have. Will continue to purchase! We loaded up our vending machine in our warehouse break room with this tasty and conveniently-packaged hot cocoa mix and we were ready to roll! Our clients and staff make comments about how good it is! I switched from the brand coffee my supplier sold me because of the lower cost and the quality is by far superior to those other brands! If you love hot chocolate, this is the one to get. This product has a great flavor! We have sold many of the coffees using the cocoa mix. It also complemented our Frappes. Shipping was reasonable. We were looking for a good affordable hot cocoa mix to use at home. This brand has a nice rich flavor and you can't beat the price! Will be ordering more! Started using this mix and my customers loved it. Has a nice rich taste to it. Going to have to start ordering cases of it. This is used in our coffee vending machine and does exactly as it describes. I thought I was getting the best deal, until I found these at webstaurantstore.com. Great price! The Gourmet Hot Cocoa Mix has a flavor similar to convenience store hot cocoa. it is thicker then Swiss Miss and has a different flavor but is still good. Not a bad hot cocoa for the price. I am ordering a second batch of this hot cocoa mix now as it got rave reviews in my home. Good quality for the price. My family loves this cocoa mix! I even add it to my coffee instead of non-dairy creamer. We took 2 bags on our camping trip to share with others and then stored the remaining in a mason jar for easy access! Heavy Chocolate flavor. I use it in my kiosk. My customers love it, especially kids and it blends well with other beverages. Webrestaurant always has it in stock. We were not impressed with this cocoa. We have used Bellagio Truffle hot cocoa for over a year now and cannot find anything similar to replace it. This cocoa is good for a base to add vanilla, caramel, etc. to, but as itself it is a bit lacking. This chocolate tastes wonderful, even when made with hot water. You may add flavor to it, but this doesn\\\\\\\\'t really need help to taste great. Not quite much of a chocolate or cocoa taste as most others brands I had. But it does have the advantage of using many non-dairy creamer ingredients, rather than much dairy products, but would still like a chocolate drink. In my case anything more than a half cup of milk every few hours make things very gassy or worse. You can also mix this cold with a trick. Add it to an ounce or 2 of cold water, & stir until it makes a even smooth slurry with no lumps. Then fill the rest of the cup with water & stir again. Unlike hot, it tastes a little watery cold. I add a teaspoon or 2 of powdered milk to it cold to give it a richer flavor, but that small amount of milk won't cause me any lactose problems. So I'll be buying more to drink cold for the summer! Best Hot coco mix value EVER. Great prices, good flavor. Clumps a little, just stir more vigorously. No complaints, everyone likes it, nice chocolate taste. I have tried it as a mocha against much more expensive cocos such as belligio which is about 5x as much and this was better. This is your typical sweet, restaurant machine-style cocoa mix, very nice when you want something warm and toasty. We kick it up with an extra pinch of cocoa, flavored syrup, or whipped cream on top. Yummy stuff. So creamy that there is no need to add marshmallows! Rich chocolate taste and so inexpensive compared to buying the individual packets. Try it! I am having such a good time making hot chocolate because it is so cheap. i am glad that this is my to-go for restaurant products and restocking my kitchen needs. This hot chocolate mix is great for family gatherings because it makes 1 and 1/2 gallons. Perfect after a crisp hayride in the fall or Christmas caroling in the winter. If you do not need the full 1 and 1/2 gallons, you can easily mix it up by the cup by using 2 tablespoons or usually one of those scoops found in powdered drink mixes are 2 TBLS size. You can store the unused portion in an airtight container. Another good use for this is on ice cream! Excellent, restaurant quality hot chocolate mix is one of the best I have ever tasted and will definitely be a winter favorite. Great value as well. I mixed this with Swiss Miss Hot Chocolate and my customers absolutely love it. I am not a hot chocolate fan but this gives the hot chocolate a nice taste.